The medicines management dashboard provides access to a wealth of data that translates easily into market-leading insight. This unrivalled depth of insight can help pharmaceutical account managers to understand activity at a local level, and develop more effective partnerships with CCGs. The tool shows prescribing activity according to CCG, and includes an number of indicators meaning that you can understand which CCGs are more effective at implementing change and which therapy areas they are focusing on. What happens beyond formulary inclusion? 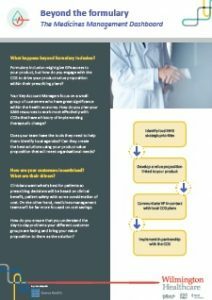 Formulary inclusion might give GPs access to your product, but how do you engage with the CCG to drive your product value proposition within their prescribing plans? The Medicines Management Dashboard is a new tool designed to support your sales and customer engagement strategies, which can help you review your entire approach to the market.